MOSCOW, October 12 (KATAKAMI / Itar-Tass) – Russian President Dmitry Medvedev hopes that the negotiations with his German counterpart Christian Wulff will be fruitful and interesting. Medvedev stated about it Tuesday opening a narrow-format meeting with his German counterpart. 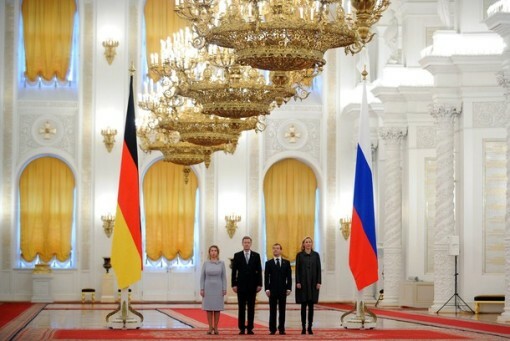 Before the negotiations both leaders with their spouses were participating in an official welcome ceremony of the German high guest, who is on a state visit in Russia. “I hope for interesting and fruitful negotiations,” Medvedev stated. 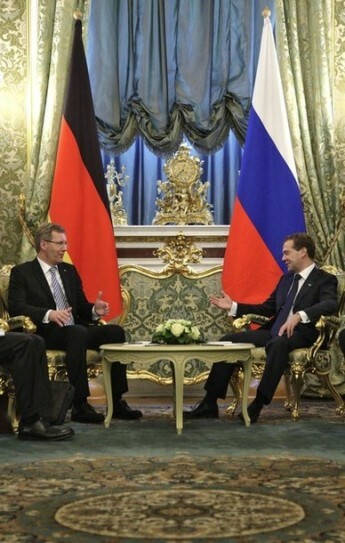 “The scale of your visit notes broad and diversified relations between Germany and Russia,” Medvedev said. “Our relations are strategic, partnership and highly developed,” he pointed out. “Germany is our major partner in the European Union,” the Russian president remarked. “We have highly developed economic ties and we also have special relations between political structures, regions, parties, civil society institutions; all this is making the essence of relations,” the president underlined. “We should develop various trends of cooperation,” Medvedev urged, noting humanitarian contacts in this respect. The German president agreed with his Russian counterpart that his visit will contribute to the development of bilateral relations. “I hope that we will have an opportunity to discuss all issues we are interested in,” Wulff said. “Germany and Russia have a long common changeable history and we take your friendship as a great gift to the German people,” he said. “Our mutual sympathy and interests confirm how close our peoples are,” the German president added. “We are following with a keen interest the situation in your country and consider ourselves as natural partners in promoting the modernization in Russia,” Wulff said. “We are seeking to intensify relations with your country, which is passing the stage of reforms, and to expand relations not only in economy, but also in education, legal protection, public institutions and culture,” he added. From left: Russian President Dmitry Medvedev's wife Svetlana, German President Christian Wulff, Russian President Dmitry Medvedev, and Wulff's wife Bettina prepare for a photo in the Moscow Kremlin, on Tuesday, Oct. 12, 2010. 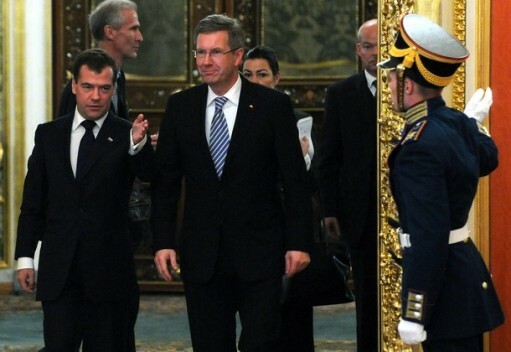 Wulff is on a state visit to Russia. (KATAKAMI / BBC) Germany has held an emotional memorial service for 21 people killed at the Love Parade dance festival last weekend. At the service, a top state official vowed that authorities would do everything to find out who was responsible for the tragedy. More than 500 people were injured during a mass panic at the event in the western city of Duisburg. As a mark of respect, flags across Germany flew at half-mast. Visibly shaken, the state governor of North Rhine-Westphalia, Hannelore Kraft, said the authorities owed it to the relatives of the victims as well as to the injured and rescue workers to thoroughly investigate what led to the mass panic in a tunnel leading to the festival site. Chancellor Angela Merkel had broken off her summer holiday to attend the memorial service at the Salvator Church in Duisburg, along with friends and relatives of those killed at the Love Parade festival. “The Love Parade was like a dance of death,” the head of the regional Lutheran church, Nikolaus Schneider, said in his sermon. 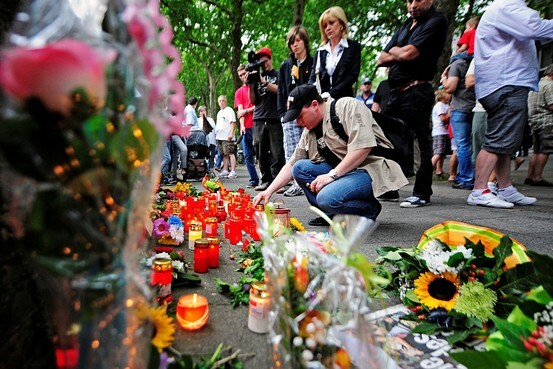 Rescue workers who had helped to look after the victims at the Love Parade site lit a candle for each person who died. They later carried the candles to the tunnel where the festival-goers were killed and where another service is due to be held this afternoon. The service at the Salvator Church was broadcast live on German television, and hundreds were watching it on big television screens at other churches and a football stadium in the city. Angelika Schick, who visited the Love Parade with her two daughters, watched the service in the stadium of local team MSV Duisburg. “I hope this service will help me to find peace”, she told German public broadcaster ARD. Before the service, church bells across Duisburg and neighbouring cities rang in memory of those who died. All week long people have been laying flowers and lighting candles at the exit to the tunnel where the deadly stampede took place. Prosecutors have launched a criminal investigation to determine whether negligent manslaughter was involved in the deaths of so many young people. Police investigators have accused the Love Parade organisers of failing to control the huge crowds which led to a bottleneck at the tunnel, the only entrance to the festival grounds. Feelings have been running high and angry residents have staged rallies demanding the resignation of Duisburg’s mayor, who has been blamed for ignoring safety warnings in the run-up to the festival, BBC correspondent Tristana Moore in Berlin says. The mayor, Adolf Sauerland did not attend the memorial service. Mr Sauerland said he feared his presence would hurt the feelings of victims’ relatives. He has been placed under police protection after receiving a number of death threats. The festival organisers have said that they will discontinue the Love Parade. People place flowers and candles in a street near the accident site in Duisburg, Germany, on Sunday. (KATAKAMI / THE WALLSTREET JOURNAL) Local authorities and organizers of Europe’s biggest electronic-music event faced harsh criticism for their handling of a massive crowd after at least 19 people died and 342 were injured in a stampede at the “Love Parade” techno festival in Germany on Saturday. The death toll continued to climb Sunday as organizers, German officials and police defended their decision to use a narrow roadway tunnel as the lone entrance for hundreds of thousands of revelers trying to reach the festival grounds in the western German city of Duisburg. The tragedy has stunned Germany, a safety-conscious country usually adept at organizing large street parties and other public events without mishap. 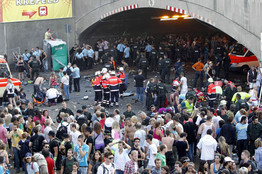 As hospitals treated many of the injured, German public prosecutors opened an investigation into what caused the crowd of young partygoers to panic and stampede in the vicinity of the tunnel. Emergency workers administer first aid to revelers who collapsed at Germany’s Love Parade. “This absolutely didn’t need to happen,” said Matthias Roeingh, a DJ known to most Germans as Dr. Motte, who founded the Love Parade festival in Berlin in 1989. “I put a lot of blame on the organizers,” said Mr. Roeingh, who wasn’t involved in this year’s event and didn’t attend. “This entry street, which brought people together at the tunnel, and the security at the entrance created a pileup. People couldn’t move forward or back. Those were the conditions that let this panic break out,” he said. As many as 1.4 million people descended on Duisburg for the party Saturday, according to German media reports, and the stampede started around 5 p.m. local time, shortly after police closed the tunnel because the festival grounds were too full. Police told those in the tunnel over loudspeakers to turn around and walk out from the direction they came, according to German media reports. Duisburg police chief Detlef von Schmeling declined to confirm the size of the crowd or that police sealed off the tunnel and told people to turn around just before the stampede. He said none of the victims—who include citizens of Australia, Bosnia-Herzegovina, China, Italy, the Netherlands and Spain as well as Germans—died in the tunnel itself, but that they fell from metal steps or were crushed against a billboard on the hillside outside as they tried to climb away from the swelling crowd. Footage on broadcaster N-TV showed people clambering over metal barricades and up a steep hillside outside the tunnel. Pope Benedict XVI, a native German, expressed his sorrow during his weekly blessing from Castel Gandolfo, his summer residence south of Rome, and said he was praying for the victims. The Love Parade was a Berlin institution during the 1990s, drawing techno fans and party-seekers from around the world to follow semitrailers converted into rolling dance clubs. From spontaneous beginnings, the parade grew into a major commercial event that consistently drew over a million people. Financial troubles and a dispute with Berlin officials brought an end to the event in 2007, but organizers revived it in the industrial Ruhr region that year. Last year’s Love Parade in Bochum was cancelled after city officials determined that they didn’t have a site large enough to hold the potential crowd. This year was the first time the festival was held in Duisburg. At a news conference on Sunday, Rainer Schaller, one of the organizers, said it would be the last Love Parade.